To many people, creativity seems elusive. The East Asian policymakers, especially, worried about the rote learning of their kids, are desperately scrambling to imbue them with creative thinking techniques. Would creative thinking be the solution to their economic malaise? Maybe, but the way creative thinking is taught is fundamentally wrong. You can improve your thinking skills by going through Edward de Bono's thinking course but that in no way enhances your creative thinking. The fault with the common perception about creative thinking is that most people believe that you just need to think differently. No, you can't teach creative thinking because creativity doesn't come from a lot of thinking. Creativity comes from putting together seemingly disparate but distantly related patterns. When they click, you'll get that Eureka moment when the anterior Superior Temporal Gyrus (aSTG), a small region on the surface of the right hemisphere of the brain lights up. Creativity therefore presupposes that you have a repository of patterns within yourself. The thinking part is merely linking these bits of patterns together. The bigger chunk of creativity is observing which takes years while the thinking part is very minor. So to force creative thinking onto someone with limited observational past is an effort in futility. Steve Jobs, famous for his insanely great creativity, claimed that the best inventors sought out diverse experiences, which years later became the raw material for their creativity. Jobs didn't seek experience solely in computing; in fact, he never coded a single programming line. But he had diverse experiences: dabbling in Hinduism and Buddhism, hanging out with friends in different fields, experimenting with psychedelic drug, to name a few. Recognising the value of diversity, he designed Pixar's headquarters such that all the bathrooms were placed in an atrium, increasing the likelihood of writers and programmers bouncing into one another to facilitate the sharing and cross-fertilising of ideas. If all lifelong, one has been specialising in only one field, there's very little chance of he/she having great creativity. Another advice from Steve Jobs: "You can't connect the dots looking forward; you can only connect them looking backwards." So, to dream up the future, always look back and piece the past with the present, to wit, what's unfolding right now. This association of random patterns doesn't come about when you're focused on the problem but when you're not thinking seriously about it, that is, when you're daydreaming. Under normal conditions, the brain inhibits blood flow to the aSTG. Only when the brain is relaxed will this inhibition ease. The beauty about storing patterns is that you can easily recall them. Here we can bring up Edward de Bono's insight. He wrote: "Once a pattern has been formed then the mind no longer has to analyse or sort information. All that is required is enough information to trigger the pattern. The mind then follows along the pattern automatically in the same way as a driver follows a familiar road." Certainly, we can be misled by the wrong pattern. But we can always empirically test its suitability by going back to the past, not just a few years but thousands of years. If reality unfolded according to the selected pattern, then our pattern is the right one. We can also go forward by checking the predictive power of the pattern. The power of pattern recognition and creativity can be seen in the massive role reversal in the smartphone market. 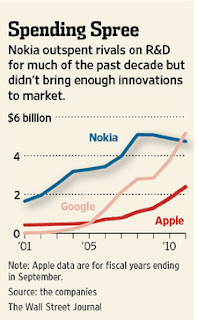 Consider Nokia, it outspent Apple and Google on R&D but just couldn't translate the spending into game-changing products. Apple was fortunate to have Steve Jobs. Whether it can continue unleashing a never ending stream of transformative products is an open question. But by the look of the recent iPhone 5, it seems that Apple has settled down on the incrementalism treadmill despite iPhone 5's record breaking sales. Its mojo has gone with the passing of Steve Jobs. To illustrate a simple use of cross-applying a familiar pattern to a supposedly complex issue, I'll demonstrate in the next post, how using a pattern from the accounting profession, we can size up the economy much better than the economist with their econometric tools. We only need the Income Statement, the Balance Sheet and the Cash Flow. The next time an economist bores you about how great China's GDP is, you can enlighten him/her on why that country is going the opposite way.